Apart from the "Rush-Hour" type of puzzles there is the conventional one. One of the most exciting ones is the one invented by E.B.Escott, an American Mathematician in 1938. 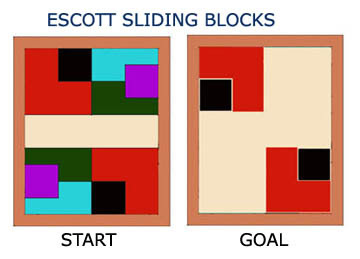 Martin Gardner said of this puzzle that "It is the most difficult sliding block puzzle "that he has seen. The optimum solution will be 48 moves counting each movement of one block as a single move even if it goes around a corner if the space is empty.